Das 'Raytzenhuys', also, The Raytzen House. —. 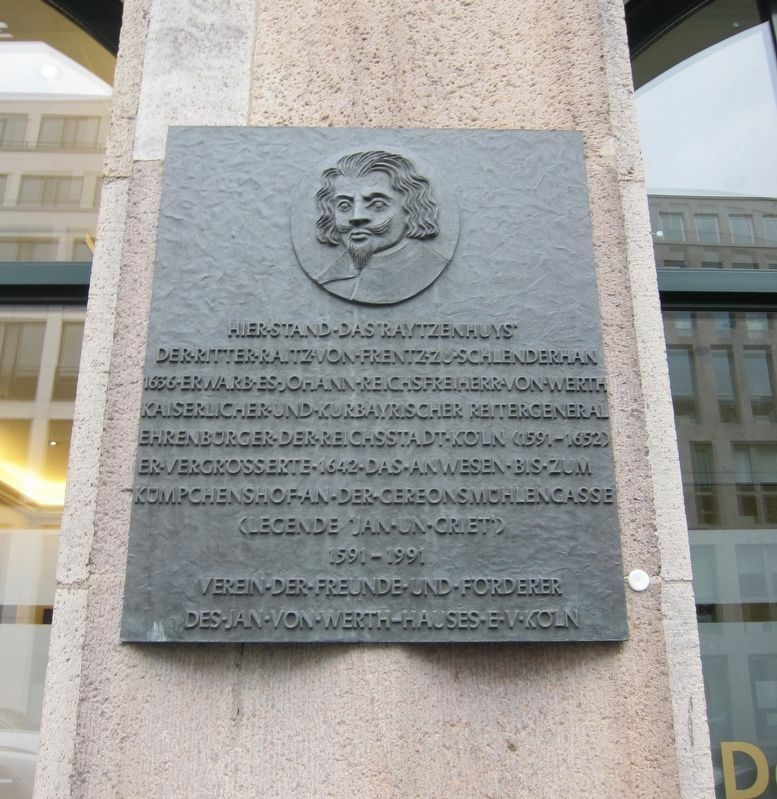 Hier stand das 'Raytzenhuys' der Ritter Raitz von Frentz zu Schlenderhan 1636 erwarb es Johann Reichsfreiherr von Werth kaiserlicher und kurbayrischer Reitergeneral Ehrenbürger der Reichstadt Köln (1591-1652) Er vergrösserte 1642 das Anwesen bis zum Kümchenshof an der Gereonmühlengasse (Legende 'Jan und Griet') 1591-1991. Here stood the "Raytzen" House, owned by the Knight Raitz von Frentz zu Schlenderhan. In 1636 it came into the hands of the Imperial General of the Cavalry, Johann von Werth (1591-1652), an honorary citizen of the Imperial City of Cologne. In 1642 he enlarged the estate to the Kuemchens holdings on the Gereon Mill Road (near here). The Legend of Jan and Griet. Erected 1991 by Verein der Freunde und Förderer des Jan Von Werthhauses e.V. Köln. and Cardinalstrasse, on the right when traveling west on Gereonstrasse. Touch for map. 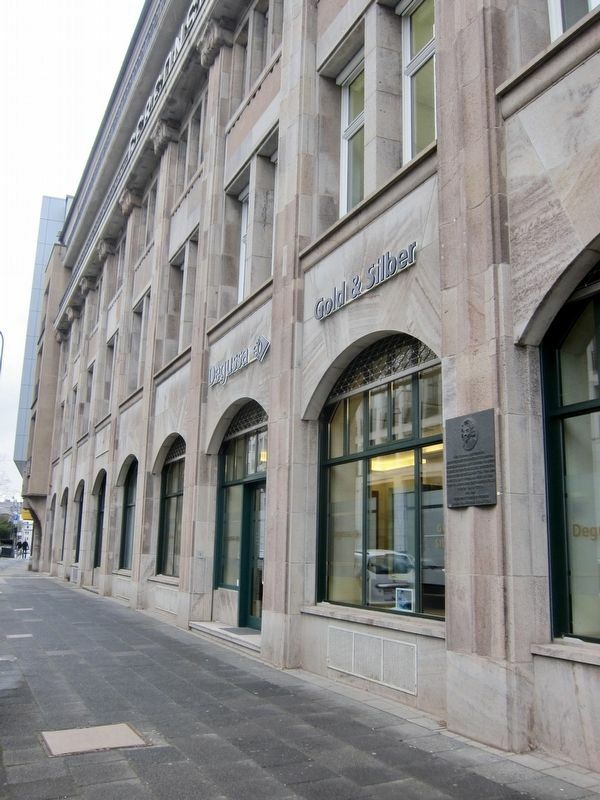 Marker is at or near this postal address: Gereonstraße 18-32, Cologne, North Rhine-Westphalia 50670, Germany. Touch for directions. Other nearby markers. At least 8 other markers are within walking distance of this marker. Dominican Monastery Site and Albertus Magnus (approx. 0.4 kilometers away); Friedrich von Spee S.J. (approx. half a kilometer away); Dr. Friedrich Joseph Haass (approx. half a kilometer away); Matthias Joseph Scheeben (approx. half a kilometer away); Georg Simon Ohm (approx. half a kilometer away); Kapelle St. Victor / St. Victor Chapel (approx. half a kilometer away); Seitenportal des römischen Nordtores/ Side Portal of North Roman Gate (approx. 0.6 kilometers away); Brauhaus Früh am Dom / The 'Frueh at the Cathedral' Brewery (approx. 0.7 kilometers away). Touch for a list and map of all markers in Cologne. More. Search the internet for Das 'Raytzenhuys' / The Raytzen House. Credits. This page was last revised on March 21, 2019. This page originally submitted on March 21, 2019, by Andrew Ruppenstein of Sacramento, California. This page has been viewed 44 times since then. Photos: 1, 2. submitted on March 21, 2019, by Andrew Ruppenstein of Sacramento, California.